Look out for this one. It's serious. In fact I think it's so serious, I'm going to waste an entire page just talking about the damage, and move on to the repair later. If you go to a vintage guitar show, I'll bet you can spot at least one vintage Martin guitar with the classic top wrinkle right over the cross brace behind the bridge. As far as I know, there's only one cause for looseness of the top over the cross brace -- heat. In the high heat of a parked car (150 to 175 degrees Fahrenheit) the bond strength of the glue is reduced and the top can actually be pulled away from the cross brace by the tension of the strings. The reason this is serious business is that it isn't always diagnosed early, and it isn't 100% certain that it can be reglued successfully. 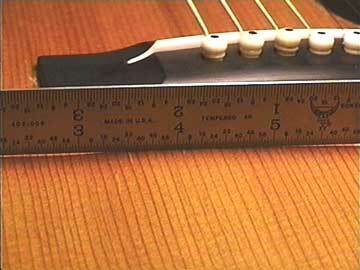 All the tension of the strings is concentrated at the bridge, and most players are aware that the bridge might pull loose, especially during heat stress. 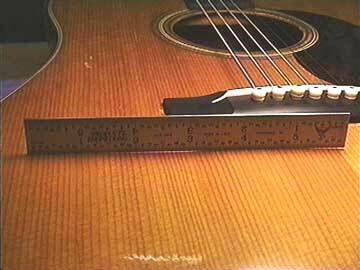 Loosening of the top braces under the bridge is not commonly discussed, even though it is sometimes a chronic problem with a guitar that may endanger its life! Let's take a look at a classic example. 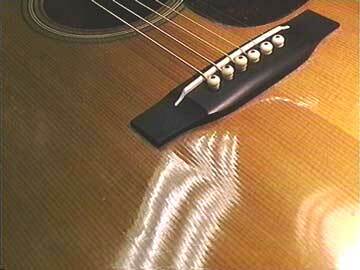 It's a 1949 Martin D-28, and it has definitely seen some overheating. The bridge had been replaced some time ago, but the looseness of the top appears not to have been noticed. OR, perhaps it was noticed, and reglued, but the glue didn't hold. I tried to photograph the light reflection from my overhead fluorescents, so you could see the wrinkle formed right behind the bridge. When I see this kind of wrinkle in this location, I don't have to look inside to check if the brace is actually loose. I know it is. It's not easy to see the dimension of the gap with this camera and lighting arrangement. Look closely at the top to the left of the major cross brace. See that very slight dark shadow? 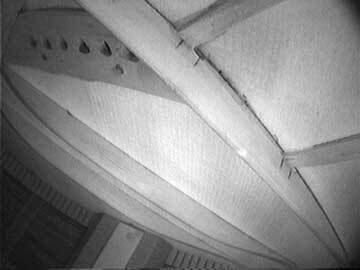 That's the shadow of the bridge, as revealed by the ambient light passing through the top. Right in the area of the shadow, the top is pulled completely loose from the brace. This is particularly nasty business on the older Martins, because the bridge plate is mortised under the brace, eliminating half of the brace's gluing surface contacting the top. On the next page, you'll be able to see the mortised bridge plate. Now, when it comes time to reglue that brace, we have a challenge. Small gluing surface, and old glue in the joint that can't be removed. That means we're gluing new glue to old glue, and wood glue has little or no cohesive strength. We hope to get it glued solidly, and clamped well so there is no extra glue left in the joint. A lot of glue buildup in the joint will cause it to fail for sure! Now, epoxy would be an exception. Epoxy has great cohesive strength and will fill wide gaps successfully. The thing is that epoxy is a giant mess to work with inside a guitar, making cleanup tricky. Not only that, but epoxy is not recognized as good restorative material except in dire emergency. 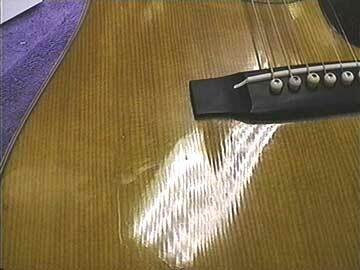 If regluing isn't successful, then perhaps epoxy is a reasonable choice. Otherwise, it might be necessary to add a short auxiliary brace in that area to help carry the load of the pull on the bridge, and couple the top to the cross brace. OK, enough bad news, now let's glue this one up!